Generally speaking, the eighteen stories that appear in this anthology fit that bill. 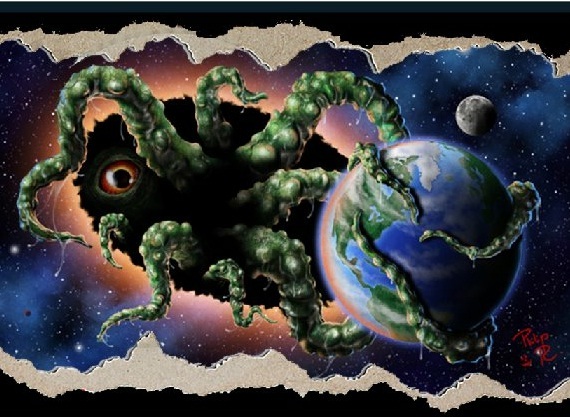 Though they are drawn from a variety of genres (contemporary horror, detective fiction, science fiction, fantasy) most succeed in making a connection with the Lovecraftian tradition. About half of the stories manage to find a tangent within that particular body of work, and then chart a unique direction therein; those are the ones that I liked. The rest run a little too parallel to Lovecraft. As a result I found those stories to be dull, predictable, and perhaps too fixated on things that go bump in the night. Still, a .500 batting average is about what I’ve come to expect as a marker of acceptable performance within an anthology. Before I get into the honourable mentions, I want to take a moment to speak on the editing. In my mind, Mr. Anderson made two significant mistakes in the way that he laid out this collection. The first was selecting JW Schnarr’s Opt-In as the lead story. While veteran readers may have no problem with second person narratives, anyone approaching this anthology as a relative newcomer to horror, Lovecraftian or otherwise, will likely find this story terribly alienating. It is never advisable to go Brechtian with the first story. Schnarr’s tale, which sees the voice of the protagonist’s dead lover usurped as a marketing tool, is certainly clever and relevant to the modern reader. Yet its tone is, perhaps intentionally, jarring to the point that the message can be lost in the prose. Sufficed to say, this was not the story that hooked me into reading on within the book. 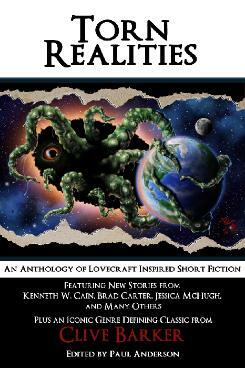 That came in the anthology’s second story, Jamie Lackey’s What Waits Out There. More on that in a moment. The other issue I take with the anthology’s editing is the placement of Clive Barker’s novella Rawhead Rex. It is ordered sixth in the book. I made a point of leaving it to the end if only out of fairness to the seventh story, The Midnight Librarians by Brad Carter. Though neither of these stories ended up impressing me, the latter being a little too predictable, and the former for its laughable invocation of menstruating women as kryptonite to a monster who eats ponies and babies, it struck as quite the aberration to make any up and coming author perform as the follow-up act to one of the genre’s living masters. Among the few science fiction stories that appear in this book, Jamie Lackey’s What Waits Out There is the best. It takes space travel seriously, in the style of James Patrick Kelly, as an activity that is unfit for human beings on a strictly biological level. It then mixes in “The Unknown” as a true horror. At its core, empathy is what drives this story, rather than the insanity one might expect given the nature of the anthology. It’s also one of the few stories that dares to suggest that the Chaos Gods, or what have you, can be overcome by us mere mortals. Kathryn Board’s The Troll That Jack Built is a magnificent piece of contemporary horror. It’s one of the few stories within the anthology that suggests the things which are known can be equally monstrous as those that are unknown. Said unknown fiend is then integrated into cyberspace, allowing for a “monsters around the corner” story that has real relevance to a modern tech savvy reader. If The Twilight Zone were still on television, this would make for a perfect episode. Ankor Sabat by C. Deskin Rink is perhaps the most archetypically Chthonic story of the anthology. I suspect the story finds its spiritual roots in At The Mountains of Madness, yet its narrative structure is wholly unique. The writing is as detailed and lugubrious as anything Lovecraft wrote. At the same time, it loosely follows the patterns of a heroic quest. Though clever readers will likely see the end coming from a distance, the protagonist’s descent into despair combined with the presence of an actual “Elder God”, replete with a chamber of mortal horrors, is quite the thing to behold. Matt Moore’s Delta Pi plays with geometry in the finest tradition of Lovecraft, himself. For anybody who has ever taken a physics course, the title tells the story before the narration even begins. In that sense, the payoff for this story is seeing what Mr. Moore does with a world where Pi is no longer a constant. Therein, perception is synonymous with protection, and Euclidean geometry is the thing that keeps humanity safe from the horrors that lie beyond the veil of comprehension. This may sound high concept, and it really is among the smartest offerings of the anthology, but it is completely accessible to any reader. Ultimately the good outweighs the bad in this anthology. Yes, there are couple problems on the organizational level. While I’ve only named four stories as exceptional, there are at least four more that are worth reading. Only two entries, which shall remain nameless, bored me to the point that I didn’t bother finishing them. As a $5 e-book via Amazon, there’s really no excuse not to buy Torn Realities. At the time of this review, Torn Realities is also available in paperback via Amazon for $13. Either way, it would be money well spent, even if every story in the collection fails to float your boat.